With Mt Feathertop as your backdrop, Mt Hotham trail running is just like its winter offering – on top of the world, challenging, exciting and ever-so rewarding. Steep climbs, long rewarding open plains and unexpected views make running at Hotham ever changing and forever challenging. With Dinner Plain just down the road, this haven for activity high in the hills is still active and waiting to delight. To book accommodation at Mt Hotham visit mthotham.com.au. "A short run taking in a big view from the summit of Mt Hotham before dropping to the northside to explore some woodland patches. " 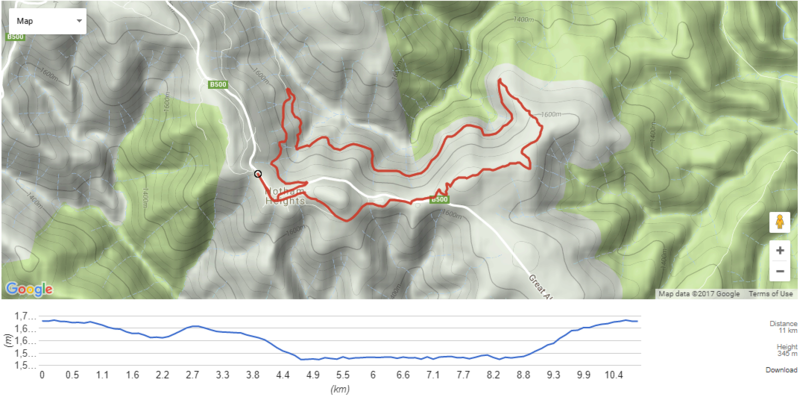 GEOGRAPHIC REFERENCES: Mt Hotham Summit, Loch Carpark, self-guided eco-walk (section Mother Johnson’s Track to the Basin). TRAIL HIGHLIGHTS: Views from atop Mt Hotham, sub alpine woodland. Beginning from Corral Car park, adjacent to Hotham Resort Management building, turn left, running past the building before veering slightly off to start your ascent of Mount Hotham (1858m). Follow the Summit Quad Lift line until your reach the top, and work your way across to the summit and the mobile tower. Enjoy the big vistas. Turn back north towards the Great Alpine Road, dropping alongside it until you are opposite Loch Car Park. Cross the road with care. From the car park, pick up the Mother Johnson’s Track heading south back towards the Village. You will parallel the road a little way before skewing left down the valley and into a stand of sub alpine gums. Make your way further across the valley face, passing under Playground Lift, and then dropping briefly into the top of a gully line before making for The Village Quad Chair lift line and The Basin. Follow the lift line back uphill until you reach the Hotham Central Building and the Great Alpine Road. Cross the road with care to the car park where you started. "A good fun ‘easy’ blue run darting out atop Big Spur with great views back over Hotham Alpine Resort and Mt Loch before dropping down to join the Cobungra Ditch, a fast and flowy section following the historic waterway. A sharp climb makes you work hard at the end (but drops you at the pub)." Beginning from in front of the General Store, turn right (south towards Dinner Plain) and follow the Hotham – Dinner Plain Trail weaving through and behind the ski lodges. You will run around the rear of Little Mount Higginbottom and take in big views south to towards Morning Star Spur. After passing a workshop compound on your left you will reach Whitey’s Car Park (2km mark). Cross the road with caution here and continue following the obvious trail. 200 metres in you will start a small climb veering up left on Charlie’s Trail before veering left onto Christmas Hill Trail. 100m past the junction, the Village Lookout offers great views and picnic tables. Follow the orange markers past Ryan’s Folly to the Big Spur Trail and the picnic area of the same name overlooking views of Mt Loch, the Cobungra Gap and Bogong High Plains. At a pinch over 4km in, there is a linking trail to the left that drops off the spur and down to Cobungra Ditch Walking Track. It is a fairly clear trail with some orange markers, spitting you out 800 metres later and 110 metres lower at the clearly defined old waterway. Take the left hand route along the Ditch and get into the flow. Watch for the odd fallen tree or scattered twigs underfoot that can trip. Otherwise this is a beautiful, flat along the valley side following the course of what was a water race taking water to the sluicing operations of the Cobungra Gold Mining Company. If you’re not worried about your splits, then it’s worth stopping at the numerous historical interpretation signs en route to inject your run with a bit of history. The trail is mostly non technical bar a waterfall crossing section, and in summer passes through spectacular wildflower zones. At 7.8km you will pass on your right a turnoff to Spargo’s Hut (part of the Black Run route). Maintain bearing ahead, passing across the face of a few ski runs, before hitting the Davenport Access Track at 8.8km. Hook tight to your right and up the hill – time to put in some legwork as you pump up 150 metres of ascent in 1.4km. You’ll meet up with the Great Alpine Road. Turn right, crossing the road where you see access trails into the lodge zone where you can pick up the Hotham-Diner Plain Trail heading right for the final spurt back to the General Store starting point.